There is still time to sign up for the February 17th Valentine's Party at Fred Wells from 7-9pm. See details below. Membership renewal time is here! If your membership has expired, please consider renewing soon. Your membership expiration date is printed on the newsletter that you should have received in the mail about a week ago. We greatly appreciate your renewal! We have two fun tennis activities this month. Our Valentine's Party is scheduled on Friday, February 17 from 7-9pm at Fred Wells. You can register on-line by clicking here and paying $15. If you are paying by mail, please send a check to Jon Holmgren, 5529 Queen Ave. S., Minneapolis, MN 55410. Please add your tennis rating when you register. Or you can pay $17 at the door. Wearing red is not mandatory. A pizza mixer sponsored by MSTC (Mixed Social Tennis Club) will be held on February 11 from 7-11pm at St. Paul Indoor Tennis Club, 600 Desoto Street, St. Paul, MN 55101. 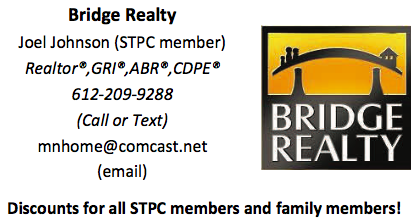 Please contact Chuck Griggs at griggscb@gmail.com for further details. The cost is $15 (non-MSTC members $20). Act on this now to save your spot! Save the dates May 1-4 so that you can participate in our annual Jack Dow tennis tournament. Registration forms were published in the last newsletter that you should have recently received recently. What's ahead for 2017? Our Long-Range Planning Committee, which Jim Handy is chairing, is looking for your input. Please contact Jim with any ideas you may have at jimhandy@gmail.com. The Valentine's Party is Friday, February 17 from 7-9pm at Fred Wells. See details in the column above or click here. Don't miss the Pizza Mixer at St. Paul Indoor Tennis February 11th from 7-11pm. Contact Chuck at griggscb@gmail.com to register. $15 (non-MSTC members $20). Copyright © 2017 Senior Tennis Players Club of Minnesota, All rights reserved.